Should you have an E-Newsletter? Of the vast array of marketing techniques, E-Newsletters can be a very effective way of building a customer base. Though they can be daunting due to their need for regular, original content, their advantages outweigh their disadvantages. However, are they right for your business? Providing E-Newsletters to your subscribers gives them a way of learning more about your company, what you have to offer and any new services or products available to them. Not only does this solidify more of an understanding of your company, but it’s also a chance for you to show you’re developing whilst communicating a more personal side to your business – which can sometimes be just what customers are looking for. The fact that E-newsletters are relatively inexpensive is also a huge bonus; you have the cost of generating the content (which may simply be your time), but that’s almost all the budget you have to set aside. Many e-newsletter distribution software services are free or very cheap; compare that to the print and distribution costs of traditional newsletters and you can see how digital newsletters can make a little marketing budget go a long way. What’s more, the analytic tools enable you to measure how many people have clicked on links and where they’re viewing from, giving you feedback that is unavailable with more traditional marketing techniques. One very important features E-Newsletters offer is the ability to customise them in design and functionality. You can add your own colours, font styles and sizes, headers and footers plus images. This gives you a lot to play around with and really create a newsletter that conforms with your corporate identity and communicates your brand values in a visually engaging way. You need to balance how often you contact your subscribers and ensure you have quality content that is of value to them to reduce the risk of people regarding it as spam, which can damage your brand reputation and their loyalty. 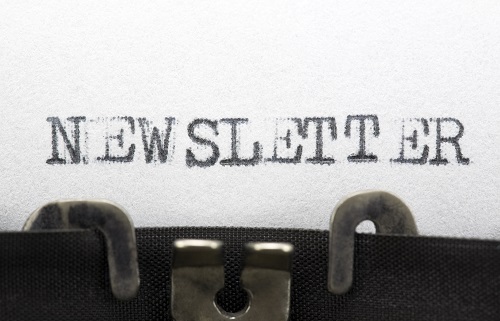 E-newsletters are an effective, inexpensive tool in your marketing strategy. The biggest hurdle is creating relevant, valuable content; if that’s a challenge for you, our article on creating content in a regular company blog will help, alternatively, we’d be delighted to discuss with you our competitive digital marketing packages, which can include both blogs and e-newsletters, to take the strain of content creation away from you.